…and that it included a spectacularly large spiral-sliced ham like mine did. I was a little late to the ham-buying game this year, as I was stranded in Denver in the midst of a blizzard (more on that in a future post on the 2016 Nutrition and Health Conference) and didn’t get home until Good Friday. So when I went to the store to purchase a smallish ham for the six people who would be eating Easter dinner at our house, there were in fact no smallish hams to be found. All that was left were mountainous hunks of ham, like, half-a-pig-sized, fill-your-entire-cart-sized hams. I ended up hauling home the smallest ham I could find, which was the size of a human toddler (okay, it was just shy of ten pounds). Still, calculate out ten pounds of ham for six people and you get waaaay more than anyone should be eating at one sitting. So we are now sitting on several good-sized Ziploc bags of frozen ham. I am definitely not complaining. In my experience, bags of pre-cooked meat in the freezer are a total boon to meal planning, especially on the quick. There are so many meals that beg for pre-cooked meat to eliminate one step in the dinner prep process. Over the years of hosting holiday meals and having leftovers, I’ve tried to get creative and have found there are so many ways to incorporate cooked ham into lunches, dinners, breakfasts, and appetizers. 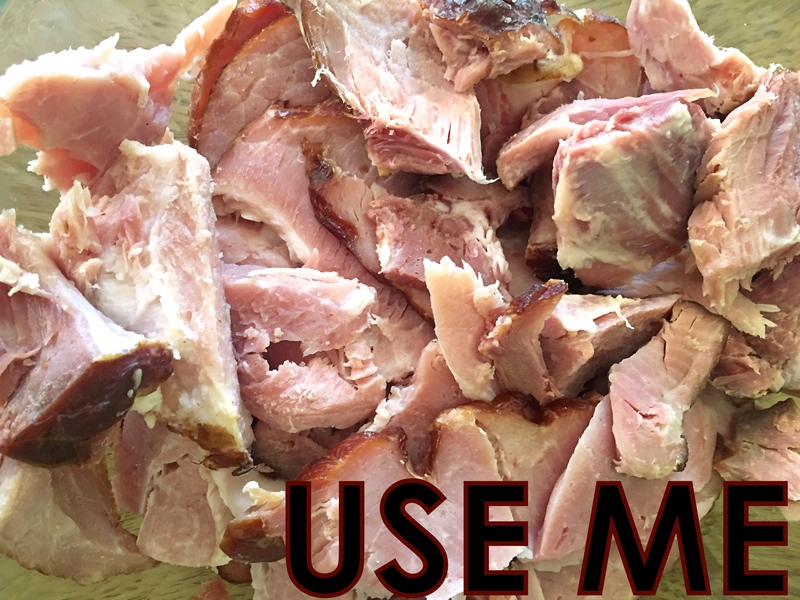 So if you, too, are harboring leftover ham, allow me to offer you ten delicious options for using it up! You know the drill: crust, marinara, mozzarella, pineapple, and ham. Easy peasy! Mix 1 cup ham into your favorite mac and cheese recipe for a protein boost. A classic. Right here on A Love Letter to Food. Also here on the blog! We had this last night with a raspberry vinaigrette–super simple weeknight dinner. I had this combo at a restaurant on Bainbridge Island near Seattle and have been dreaming of making it ever since. Toss some cubed ham in with eggs and cheese in a tortilla for a satisfying breakfast. Try this recipe, adding ham and peas for a one-dish meal . Mmmmm, risotto! Or should I say hammm risotto? This one with sweet potatoes is on my list. Here’s to a hammy several weeks ahead! This entry was posted in Other, Recipes and tagged Pork. Bookmark the permalink.